Well it’s raining here in the grand Ol’ South in the middle of no where. The sky is gray and the fireworks have been canceled and needless to say I am glad the little one is already in the lights of the big city with her aunt enjoying the day. So I thought to myself NO! I am not going to let this weather get me down. Don’t get me wrong, I am not going out in this pouring rain, but I am however going to make my beer can chicken! I will just have to do this in the oven. 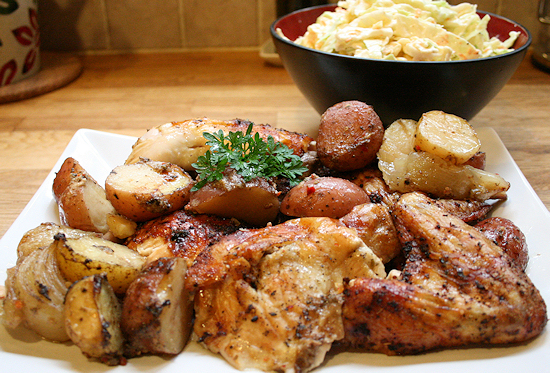 It is time to test the new Weber Beer Can Chicken Spice Mix! Good thing I made the Bar-B-Que yesterday(We will see that in another post). 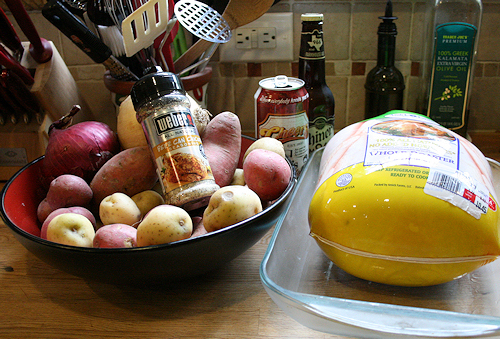 Yes, Beer can chicken, why did I capitalize Beer? Anyway, this is what we need to cheer us up with this 4th of July rain out. 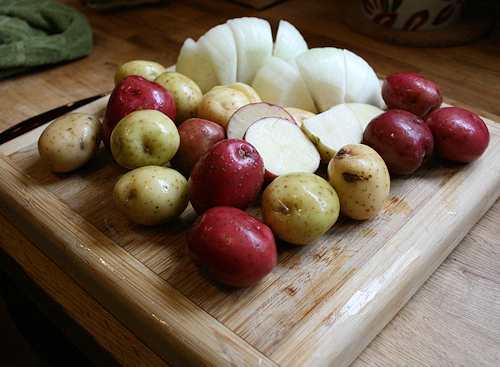 First thing, cut your onion in quarters, wash your potatoes nice and clean and start halving them, the tiny ones you can leave whole. 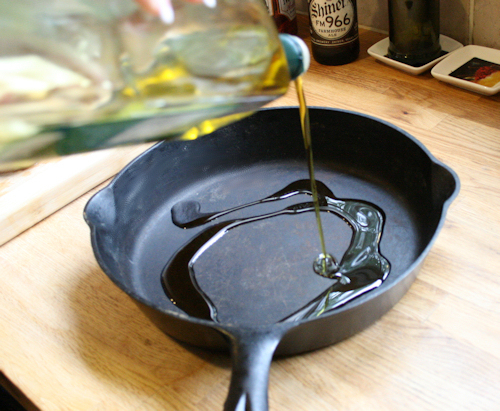 Add about 1/8 of cup of oil to a large baking pan for the oven. Preheat oven to 300 degrees. 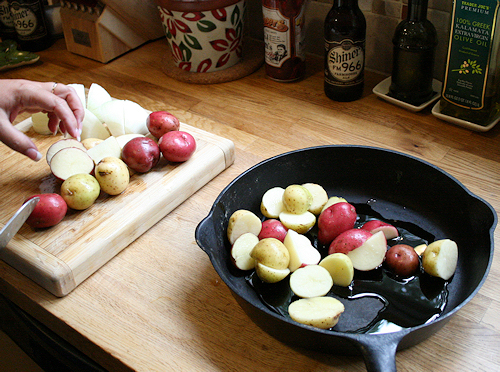 Add potatoes into pan and toss around in the oil to coat. 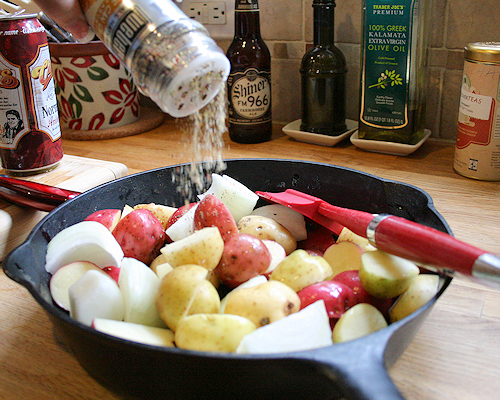 Then add a generous sprinkling of the Weber’s Beer Can Chicken seasoning on the potatoes and coat again. Sprinkle lightly with some kosher salt. 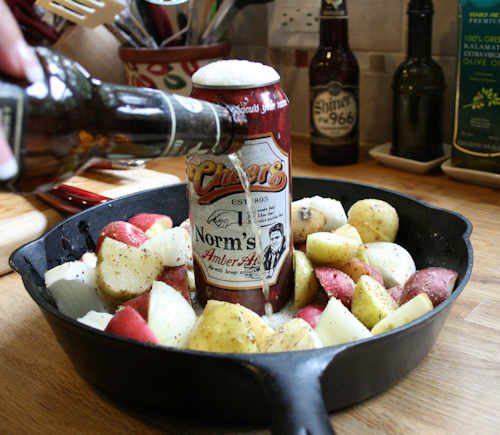 Place your half full beer can in the center of the pan. Now here is a funny story. I went in the fridge to get the beer and guess what? YES! It was gone! Soooo, luckily I was able to recoup the empty beer can from recycling bin, wash it and use it. I was happy to see I had two bottled beers on hand to use as filler. DO NOT use bottles for your chicken, it will not work and will break, you must have a CAN and the taller the better. 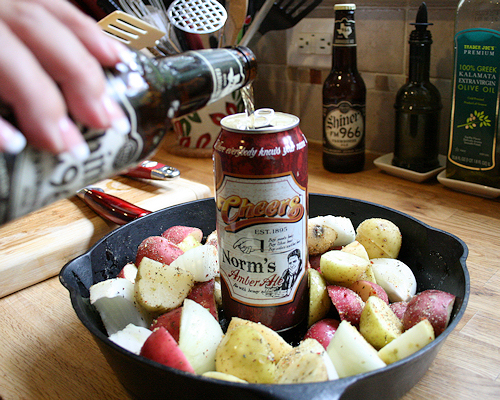 So, back to the recipe; place the beer can in the middle of the potatoes. If you have people that poach your beer then fill the empty can half way. If not, pour half into the can and reserve the rest for the pan itself. I must admit I loved to see it foam out the top, but I am easily amused. 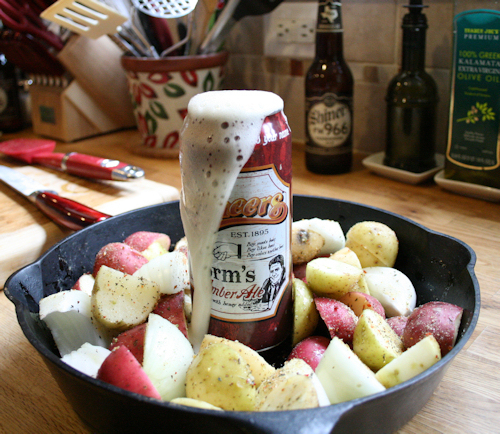 Then take the other half of the beer and pour around the potatoes. Down the side is good. You don’t want those seasonings to rinse away. Time for the chicken!! Here chicken, chicken… Ok I won’t do that. Open the chicken and make sure you remove everything from the inside. Any package of innards or neck etc.. Make sure it is all removed. 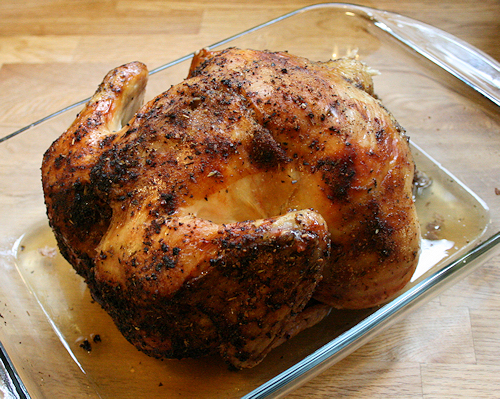 Hold your chicken right side up and slide it right onto the can. Shift around until properly balanced and sitting happily in the baking pan. 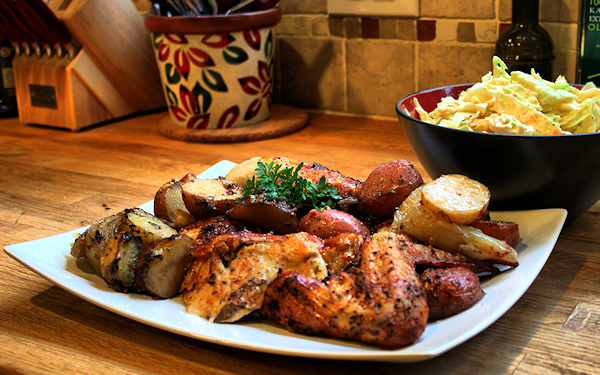 Take the olive oil and lightly rub the chicken then do the same with the spices. I took the seasoning and poured it into my hand then patted the chicken all over. This way any extra seasoning just fell right into the pan. Voilà! Now, into the oven you go! I have to stop talking to the chicken. This rain is getting to me. 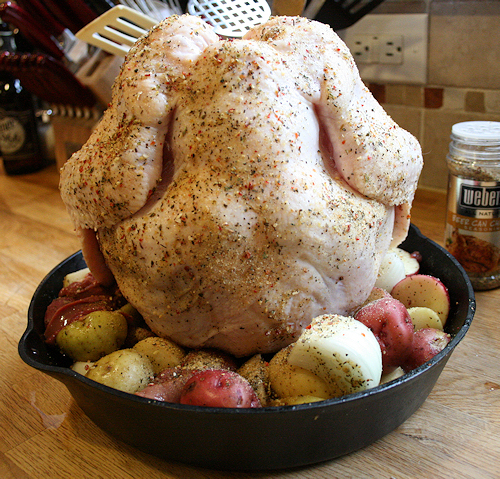 This will need to cook about an hour and a half to two hours for a 4 lb chicken. But just so you have the lo down, keep checking the chicken every 30 minutes or so. Take a meat thermometer and insert it into the thickest part of the thigh. 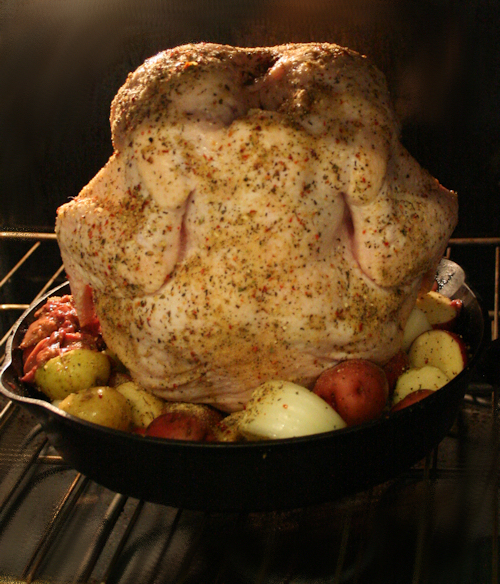 You want to cook it until it reads 160°F – 165°F. 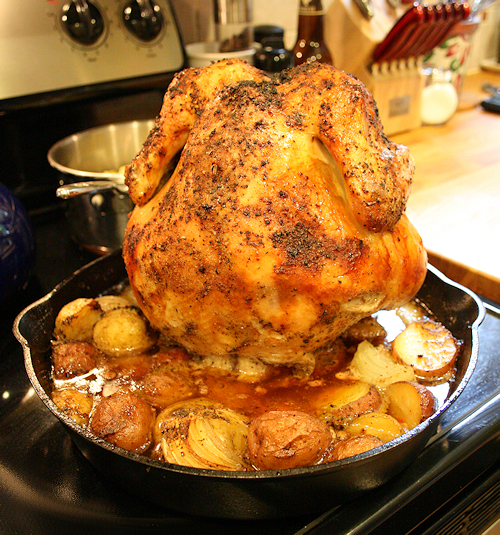 A 4 lb chicken will usually take around 1 1/2 hours. And this is what it looks like done. Pretty, huh? 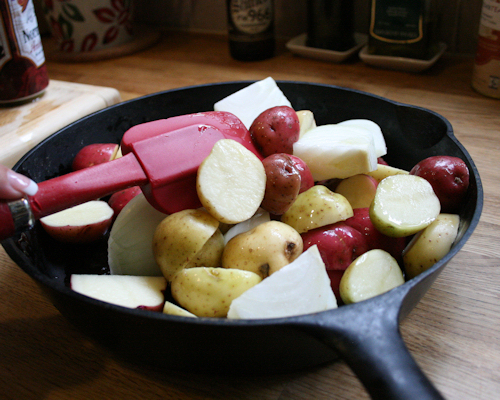 Time to take it out though and place it in a large casserole dish. We need to preform surgery and get the can out of her bum. Hahaha ok, sorry I could not resist. Oh my gosh, stop raining!!! Let the chicken rest for 10min. A lot of people gave good, sound advice for removing the can from the scalding hot chicken. I did not take any of it. I went the simple route and stabbed the can with a fork poking it clear through and pulling it out sideways right there in this pan, Worked like a charm and I didn’t make a mess!! Some people tear, some people pull, I cut it and placed nice pretty pieces all around on a large serving platter. My party on my new deck might have been canceled but I will be darned if my plate was not going to look pretty! And that it did. The taste was even better. I must say the seasoning definitely needed that touch of salt but all in all it was not bad. I do love the seasoning though I use for pulled pork and think it would be stellar on this as well. Please note: You can do this same recipe on the grill if the sun is shining and use the same directions except using a grill safe pan or a good balancing act over charcoal. One hint: The darker the ale, the richer the taste of the sauce. Bon Appetite!